Almost always seen wearing a happy smile, Spain is a lush kingdom in southern Europe who prides himself on his warm climate, plentiful sunshine, and bountiful nature. He has somewhat curly brown hair, green eyes, and lightly tanned skin, but his skin tone is sometimes shown as fair or olive. In the past, he raised Romano (then Chibiromano). He wanted to take Italy (then Chibitalia), but ended up with Romano after Austria took him. 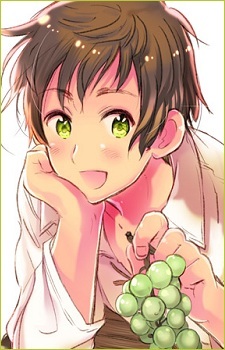 It has been shown that he cared greatly for Romano and his wellbeing, despite Romano having seemingly bitter and negative feelings towards him. Spain cared about Romano so much, that he fought off France and Turkey (then the Ottoman Empire) just so that he could remain at his house. He also later spoiled Romano, just to show that he still cared about him when Romano thought that he liked Italy more. He taught Romano everything he knows, thus the reason for the many cultural similarities between the two. Even though Romano no longer lives with him, Spain is still very affectionate towards him to this day, and has a very big place in his heart for him. At one point, Belgium and the Netherlands also lived in his house. It is currently unknown what their present relationship with him is exactly like, but in the 2010 Christmas strip, the Netherlands was shown celebrating Christmas with Spain. According to the history, they were allied during the War of Austrian Succession, and was shown the three's loyalty towards each other. The three of them are closely related. Himaruya Hidekaz stated that the Bad Touch Trio are best friends. His personality is bright and optimistic, and he can be described, more or less, as a cheerful country bumpkin. He claims that the source of his happiness is the sun that shines over his land constantly. Despite this, it is said that he is very, very scary when angry, and that he sometimes comes off as insensitive and totally clueless. Spain also becomes sidetracked and enthused very easily. He used to be an extremely powerful nation who traveled around the world, but was then beat up by a young America, pirate England, and the Netherlands, sending him face first into poverty and wars, and stripping him of his super power status. But with his easy-going personality, he’s managed to get back on his feet over the years. His dishes consist mainly of tomatoes, tomatoes, and tomatoes, and sweets that are described as not being very sweet.